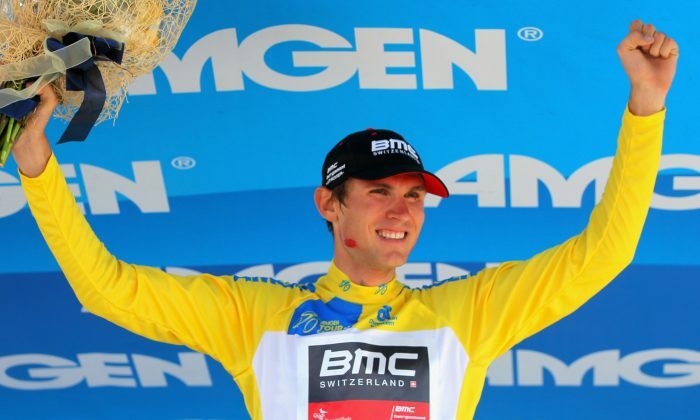 BMC’s Tejay van Garderen was by far the fastest rider over the tough Stage Six time trial course in the 2013 Amgen Tour of California, negotiating the hilly, twisty course with its brutal final climb nearly half a minute faster than his nearest competition. The win gives the 24-year-old American rider a 1:47 cushion heading into the race’s Queen Stage which finishes atop Mount Diablo. The course was challenging not just because it was long (131.6 km) twisty and hilly, but because it finished with a three-kilometer, ten-percent climb. Some riders opted to swap their time trial bikes for road bikes at the base of the climb, figuring the ten seconds lost to a bike swap would be balanced by the quicker climbing. Van Garderen chose not to switch; he felt there were too many chances for something to go wrong, and on his morning reconnaissance ride, he found that he could manage the TT bike up the climb. The BMC rider’s 26-second margin of victory had nothing to do with bike swaps; he simply rode faster than everyone else. Van Garderen was the only rider to break 48 minutes with is time of 48:49. Vacansoleil’s Lieuwe Westra, who wore the yellow jersey early in the race, finished second in the stage with a time of 49:15. Third went to Garmin-Sharp’s Rohan Dennis at 49:20. Janier Acevedo of Jamis-Hagens Berman, who lost the jersey when he didn’t catch the Jens-Voigt led breakaway in the final third of Stage Five, turned in a decent ride for someone who is not a TT specialist. He looked particularly comfortable on the final climb, and could be a threat in Stage Seven. The Colombian rider made two bike changes, one for a derailleur failure and one for his road bike, and still managed to finish 18th, 2:41 down. He is fifth in General Classification, 3:31 behind Van Garderen. 2010 winner Michael Rogers of Saxo-Tinkoff finished fourth, 1:05 behind Van Garderen, which moved him up to second in GC, 1:47 down. Rogers changed bikes, and not too swiftly, but it didn’t cost him more than fifteen seconds; he wouldn’t have finished better had he not changed bikes. Orica-GreenEdge’s Cameron Meyer finished sixth with moved him to third in GC, 2:57 back. Van Garderen’s BMC team mate Matthias Frank came in ninth, and advanced to fourth in GC, 3:21 behind, opening the door to having two BMC riders on the final podium.